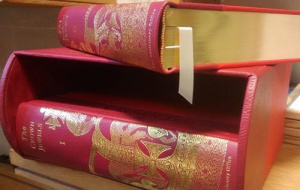 Univ has been fortunate to receive this wonderful two-volume set as a donation from Old Member Dr Roger Harding. Dr Harding read for a DPhil in Earth Sciences here at Univ between 1959 and 1962. 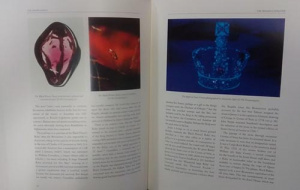 He went on to become Director of Gemmology at Gem-A (the Gemmological Association of Great Britain) – of which he remains an Honorary Life Member and Fellow – and to co-author several publications including The Crown Jewels, which was published in 1998. The set is a true collector’s item in terms of its rarity and the quality of its construction. On the verso of the dedication page of Volume 1, a declaration signed by Sir Hugh Roberts, who was Director of the Royal Collection until 2010, states that the quarter bindings of goatskin were made by Cedric Chivers Ltd and the text was printed on Robert Horne’s White Mondial Silk 170 gsm paper by Heanor Gate Printing Ltd. These companies were once among the elite of Britain’s book industry but have sadly not survived rapid change in the business, making their creations symbolic of a bygone era. Even more interesting in Sir Hugh’s declaration is the statement that only 650 copies of the set were produced, of which this is number 215. A catalogue search reveals that only four UK universities besides Oxford own copies. Others are held in prestigious museums and national libraries. One or two remain available for sale, but at a very considerable price, making Dr Harding’s generosity all the more remarkable. Each volume has a distinct focus. 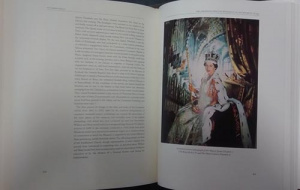 Volume 1 is historical, containing extremely detailed accounts of every Coronation ceremony held in Great Britain from Anglo-Saxon times to the reign of Elizabeth II. Extracts from eye-witness accounts are combined with original research and high-quality reproductions of contemporary images. There is also a chapter on the History of the Jewel House at the Tower of London, where the British Crown Jewels and other ceremonial regalia have traditionally been kept. Appendices list the dates of coronations from William I onwards, the names of Keepers of the Jewel House and Royal Goldsmiths and Jewellers, the expenses required to stage Charles II’s ceremony (as an example of a typical coronation), and the ingredients of the sacred anointing oil used to wet the monarch’s head. 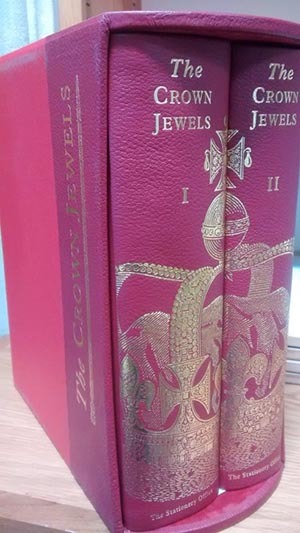 Volume II is a full catalogue of the Tower of London Jewel House Collection as it stood when the set was published in 1998. It is divided into four sections: Regalia (i.e. crowns, sceptres, orbs and other jewelled ornaments worn or held by incoming monarchs), Swords, Plate (which includes large metal items such as maces and trumpets as well as literal plates), and Textiles. Dr Harding and two of his fellow gemmologists contributed scientific appraisals of all of the precious stones in the collection, along with vivid close-up photographs. 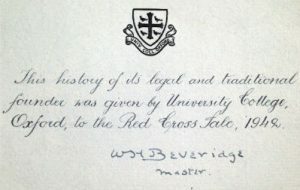 The Old Member connection is obviously an interesting link to Univ, but the set can also help to illuminate aspects of the College’s broader history. 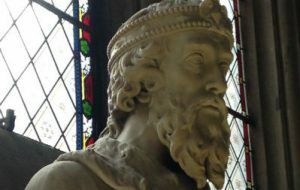 While it is now well-known that Univ cannot claim to have been founded by King Alfred the Great (see the May, June and July 2015 Treasures), the College has been honoured by visits from both James II and Elizabeth II as reigning monarchs, and from the heirs who would go on to become William III and Queen Anne. 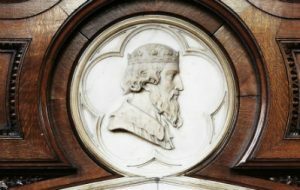 Many of our Masters have enjoyed close relationships with the Royal Family, not least Obadiah Walker, who was supported by James II in his shocking (for the time) conversion to Catholicism. The King made legal exceptions to allow Obadiah to print Catholic texts and build a second, alternative College Chapel. The official royal visit was a diplomatic occasion that aimed to promote religious diversity rather than uniform adherence to a specific faith. It involved tours of both the Catholic and Protestant Chapels and the opportunity for a Protestant Fellow to kiss the King’s un-gloved hand, which was considered a great honour. Sadly for Obadiah, his and James’ collaboration ended disastrously when King William III took over the throne in 1688 and Obadiah was imprisoned in the Tower of London for his religious views. In Volume I of The Crown Jewels, one can read all about James II’s Coronation and trace hints of the type of monarch he would become. According to historian Shirley Bury, who wrote this section of Volume I, James cut the Communion from the Coronation service and shortened parts of the rest, out of loyalty to his Catholic faith, but he also made sure the Coronation was a lavish spectacle that citizens of all religions could enjoy. Contemporary writers such as Aphra Behn praised the ceremony, but public opinion quickly changed upon the arrival of William III, with people suddenly remembering ‘omens’ of the impending defeat of James and his followers, including a flag on the White Tower being ripped by the wind at the moment the Crown was placed on James’ head. Sir Hugh Roberts notes in his Foreword to The Crown Jewels (v. 1, pp. xvi-xvii) that the set ‘will become the standard reference to these iconic objects, and by helping all those millions who come to the Tower every year to understand them better, will have truly served the institution of which the Crown Jewels remain the most enduring symbol.’ Thanks to Dr Harding, the Univ community can learn all about such an opulent and alluring aspect of British history simply by visiting the College Library, and we are very grateful to Dr Harding for this lovely gift.